Author Naimu has seen her friends get married and struggle to balance marriage and their professional careers, so she took her experiences and stories from other wives and wrote “Successful Housewives” (published by Partridge India). Successful housewives according to me are those women, who after marriage maintain a balance between their passion and household work. 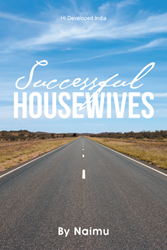 In this book, I have put all those people interviews, who I feel are suitable for the title “Successful Housewives”. I really hope, reading these, you also attain this title one day. Approximately 50% (of) Indians are women. (With) 50% of India doing nothing, India can’t change from developing to developed country. Naimu has observed many housewives who are able to manage their passion and household work successfully. She has even seen many who are not able to manage both with ease at the same time. She has recently graduated and is on a mission to illuminate others. This is her first book. Partridge India, is a leading provider of book publishing, marketing, and bookselling services for authors in India, all priced appropriately for the Indian market. Committed to providing the highest level of customer service, Partridge India assigns each author personal publishing and marketing consultants who provide guidance throughout the process. Partridge India shares its headquarters with Penguin Books India in New Delhi. For more information or to publish a book, visit partridgepublishing.com/india or call 000.800.10062.62. For the latest, follow @PartridgeIndia on Twitter.